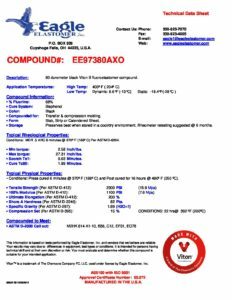 Viton Fluoroelastomer Compound EE97380AXO - Eagle Elastomer Inc.
 Min torque: 2.58 Inch/lbs.  Max torque: 27.31 Inch/lbs.  Shore A Hardness (Per ASTM D-2240): 82 Pts.